So blogging has not been on the top of my priority list. Mid-August through September is when the fog belt of the Bay Area gets its real summers. Days occasionally get into the 80s and summer fog is less frequent. I've been going to the beach, harvesting stuff from the garden for myself and friends, and trying to be outside. 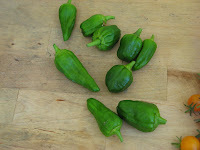 Here are some pics of veggies from the garden that I turned into dinner for a few friends Tuesday night. 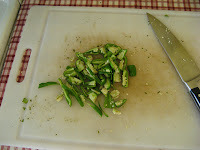 It was the first complex meal I'd cooked for others where all the herbs, veggies, etc. came from the garden. 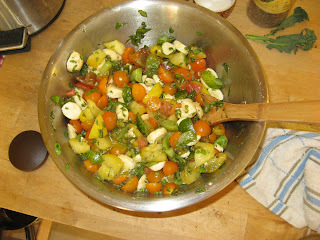 This rainbow array of tomatoes was turned into caprese salad. It just needed some garden basil (including some lemon-lime variety), some mozarella, olive oil, a splash of balsamic vinegar, and salt and pepper. As an appetizer I made the padrons mixed with gypsy peppers (a sweet variety) described in a previous post. For the main dish we grilled up some chicken breasts and I sauteed some rocoto or locoto peppers (minus the seeds) in olive oil and added some merkén (a Chilean mix of spices) to pour over the chicken. Had a very strong kick. 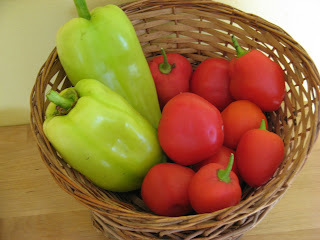 Here in this pic are the gypsy (greenish) and rocoto (red) peppers. I also cooked some of those yellow tomatoes with basil and garlic from June and mixed it with barley to go with the chicken. Barley is great, just cook it like brown rice. 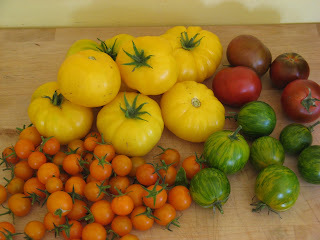 The yellow tomatoes are a complete mystery. The plant was mislabeled by the nursery as Black Krim. They're delicious all the same.